Welcome to round two of Wikiedit, in which I explore extremely random Wikipedia articles for my own amusement. Last time it was powerful Eastern European hordes and their extraordinary migrations. This time we lake a look at a slightly less consequential article, some might say, but it features equally incredible movements and acts of strength by Eastern Europeans. And isn't "inconsequential" the whole point of Wikipedia?! I think so. 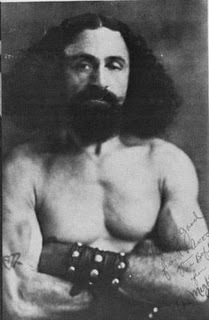 Yes folks, roll up for Joe Greenstein, aka The Mighty Atom, an article about a tiny Jewish guy that makes phenomenal use of Wikipedia's greatest comedic asset: the "citation needed" tag. More on that in a moment. Born in 1893, Joe was a sickly Polish kid. The thing to bear in mind as you learn more about him, is that even when full grown, he never measured more than 5'4". Doctors predicted death by tuberculosis. But after training with a Russian strongman named - apparently in all seriousness - "Champion Volanko," he seems to have conquered his physical limitations and transformed into something great and terrible. Joe immigrated to America before WWI, initially setting up shop in Texas. This is where Wikipedia uses the first of several mouth-dropping sentences. In 1914, a local Texas man who was obsessed with Greenstein's wife shot him between the eyebrows from a distance of 30 feet. Amazingly, Greenstein left the hospital on the same day - the bullet did not enter his skull, but was flattened by the impact. It's the specificity here that I like. They could have written "shot him in the head", but no. You can see the bullet literally sticking between his eyebrows as he goes cross eyed for a second and topples over, with everyone in the room gawping in mute astonishment. This sentence is also one of two in the whole article that mention Joe's wife. The other one tells us her name was Leah. So much for her. Anyway, at this point, Wikipedia gives up trying to string coherent sentences together about this guy and resorts to simply listing the feats he preformed to prove that he was a superhuman of Luke Cage proportions. (Wikipedia hints that he was actually the inspiration for DC's reasonably major hero, the Atom). These include hammering nails with his bare hands, supporting the weight of 14 men while lying on a bed of nails, and bending a horseshoe with his teeth. Resisting the pull of an airplane with his hair. I mean, the horseshoe thing is reasonable. But when you're talking about bending steel with your hair, you need a goddam citation, am I right? How would that even work? Can he make his hair move of its own accord? By the way, this is the Mighty Atom, if you want a mental reference for that superhair. I can bite your coins in half. So what? But the best is still to come. In 1939 - it doesn't say whether the war had actually started yet - the Mighty Atom single-handedly beat 18 Nazis to a pulp with a baseball bat. This event, which surpasses even Tarantino's most fevered Jewish revenge fantasies, led to his arrest on charges of "mass mayhem", surely the coolest misdemeanour to have on your record. And he didn't have a scratch on him when the dust settled, even telling the judge, "It wasn't a fight, your honour. It was a pleasure". It was many years before the technique was known to most Americans. Well. I mean, if Wikipedia tells us that most Americans now know jujitsu, then it must be true. But it would be quite nice to have a citation for that, I agree. Joe continued his performances into his eighties, as the article states casually, when he was finally brought down by cancer. In later life he also sold "elixirs", while he "traveled in an old Model A truck with panels that opened to show his extensive collection of newsclippings and citations from civic leaders and organizations." Well at least someone's got some citations around here. Still, it's a somewhat sad closing image. The great hero who's time in the spotlight has faded, reduced to living in a car with his glory days scrapbook. Joe's son Mike Greenstein appeared as a 93-year-old on America's Got Talent in 2014 and successfully pulled a 3500 pound car with his teeth. Finally, a citation for some closure. Beautiful. PS: If you've read Michael Chabon's Amazing Adventures of Kavalier and Clay (highly recommended) you may understand how I discovered this article.